The recent air strikes in Syria, attributed by foreign reports to the Israeli Air Force, should be seen as part of a larger, covert struggle between Israel and Iranian-backed terror organizations, with each side preparing itself for the next round of open hostilities which may be more destructive than anything seen so far. The decision to launch the air strikes was based on the understanding that a calculated risk now is preferable to facing a deteriorating security situation later. The air strikes were aimed at decreasing Hizballah's accurate destructive power, and preventing the Iranian proxy group from being able to precisely hit sensitive targets deep inside Israel. Hizballah chief Hassan Nasrallah has publicly threatened to strike places such as the petro-chemical plants of Haifa, as well as dense civilian population centers in the greater Tel Aviv area, home to 3 million people and Israel's economic nerve center. 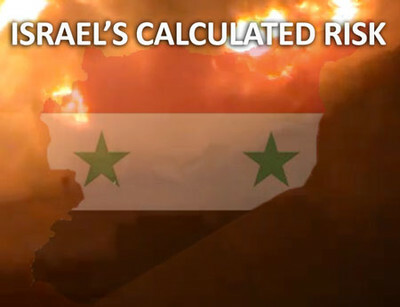 But Nasrallah's plans faced a setback this month, when stunned Damascus residents used their cell phones to record enormous flames rising into the night sky in the Syrian capital. The targets that were hit in the air strikes were, according to reports, storage facilities housing batches of guided Iranian Fateh 110 missiles. These missiles would have given Hizballah an unprecedented capability to direct accurate fire power at Israel. The missiles were unloaded from Iranian aircraft at the Damascus international airport and stored at facilities ahead of their planned truck transport to Lebanon, according to Israel's Channel 2 News. This is the standard weapons smuggling route used by Iran and Hizballah for more than a decade. With a range of 186 miles, the latest generation of the Fateh 110 has ability to hit targets inside an accuracy range of 650 feet. Having turned southern Lebanon into one big rocket base, Hizballah is focusing its future attack strategy around the goal of paralyzing the Israeli home front, by flooding Israel with tens of thousands of rockets. Hizballah has an estimated 80,000 rockets – an enormous number of projectiles in the hands of a radical non-state actor. Most are short-range Katyushas rockets, though Hizballah is believed to also possess longer-range rockets and missiles that can strike deep into central and southern Israel. Iran's overseas military unit, the Quds Force, has quietly been working to ensure that Hizballah has numerous Scud missiles, Syrian M-600 missiles (based on the Iranian Fateh 110), Iranian Fajr rockets, and Iranian Zilzal missiles. Although destructive, none of those threats are particularly accurate, and they lack the guidance system of the Fateh 110. When Israel reportedly took the decision to twice strike the missile storage facilities in Damascus, it apparently came to the conclusion that the risk of the Fateh 110 falling into Hizballah's hands outweighed the risk of sparking a direct conflict with Syria or Hizballah. There are several likely calculations behind this evaluation. First, the targets hit in Damascus were not Syrian military installations, according to former IDF Military Intelligence Chief Maj.-Gen. Amos Yadlin, but rather, Iranian and Hizballah facilities on Syrian territory. That fact could make it easier for Syrian President Basher Assad to refrain from committing himself to a direct response. Second, Assad is making gains in his war against the rebels, and is not interested in risking his achievements – or the future existence of his regime – by directly responding to Israel. Hizballah is deeply invested in the Syrian civil war, with half of its fighting force in Syria. It is helping the Assad regime seize strategic areas near the border with Lebanon. Neither Syria nor Hizballah would want to take their eyes off their main goal of securing Assad's survival, especially in light of the fact that Israel has the ability to level enormous destruction on them both. Hizballah, for its part, is already facing growing criticism from Lebanese non-Shi'ite citizens, who question its regional agenda, and who would not readily accept Hizballah dragging Lebanon into a new war with Israel. Hence, a Syrian response could take the form of a border incident launched by a terrorist group. Alternatively, Hizballah and Iran could activate their international terrorism networks to attack Israeli targets overseas. On the other side of the equation, allowing the Fateh 110 missiles to arrive safely in Lebanon would provide Hizballah with the ability to pose a previously unknown threat to Israel. That in turn could have boosted Hizballah's confidence to launch cross-border provocations in the short-term, increasing the chance of a wider conflict. Should Israel and Iran find themselves in a direct conflict, Hizballah would be expected to enter into the war as an Iranian proxy. Israel naturally wishes to reduce Hizballah's potential to sow death and destruction in such a scenario. The attack also touches on the sensitive issue of red lines. Israel has warned repeatedly that any attempt to use Syria as a transit point for strategic arms addressed to Hizballah would be considered a violation of an Israeli red line. The red lines include the transfer of advanced surface-to-surface, surface-to-sea, or surface-to-air missiles, as well as unconventional arms. As indicated by the reports, the air strikes in Damascus have proven that these red lines are set in stone, come what may. The red line set by Israel over weapons proliferation is also applicable to other emerging threats, most notably, to the centrifuges spinning in Iranian nuclear facilities. In the corridors of power in Tehran, the air strikes in Damascus were heard clearly, as the Islamic Republic inches closer to Israel's red line on uranium enrichment.